Both “Value of Premium Paid” and “Total Cash Value” will be calculated based on a projection (the common ones being 3.75% and 5.25% for traditional participating policies). For example, after five years with an annual premium of $1,273 projected at 5.25% p.a., the Value of Premium Paid will be $7,440 ($1,273 ever year compounded at 5.25% per annum for 5 years). The Total Cash Value will likely be much less than this amount. A sample Benefit Illustration puts it at $4,325 at the end of the 5th year. The difference in the two values is due to various amounts of money being taken out from the premium for mainly things like agent’s commissions, insurer’s profits, cost of insurance (mortality, assurance charges etc.) among other charges. 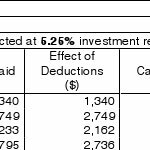 These “deductions” cause the difference between the Value of Total Premiums Paid and the actual Cash Value, and accordingly this difference is termed “Effect of Deductions”. Take a pause and decide if it is better for the policyowner to have a higher or lower Effect of Deductions. My short answer will be that Effect of Deductions alone cannot tell the whole story. While a higher Effect of Deductions can mean that the insurer earns more profits, or the agent gets more commissions, it can also mean that there is an increased cost of insurance due to a greater emphasis on insurance coverage within the policy. A person who wishes to purchase a whole life policy can compare whole life policies between different insurers. Whole life policies are typically a package between insurance and savings. If a person’s intention is to insure himself with this policy – as opposed to using it for savings purposes, i.e. surrendering the policy at a certain year to withdraw the cash value – he should be looking at policies with a greater emphasis on insurance coverage. Premium cost and all other things equal, a greater emphasis on insurance coverage would mean lower savings element (due to a greater cost for insurance). A lower emphasis on the savings element of a whole life policy will naturally decrease the cash value. This decrease in the cash value will then translate to a higher Effect of Deductions. A higher Effect of Deductions does not translate into a less suitable policy for the person. It is ridiculous to deem a term policy lousy because the Effect of Deduction is 100%. Hence, Effect of Deductions cannot be the sole basis of evaluating a policy’s effectiveness in providing insurance coverage. Effect of Deductions can, however, be a useful gauge to evaluate an insurance product geared towards savings, i.e. a savings endowment policy. It can provide some indication of the policy’s overall expense ratio, which one can then use to compare it against other classes and types of investments available in the market.